I must admit I’m a sucker for gathering my lunch from my own garden, especially when it’s adorned with a pretty flower or two. There’s something about that “I haven’t got anything for lunch” to “oh look, almost a complete meal”. 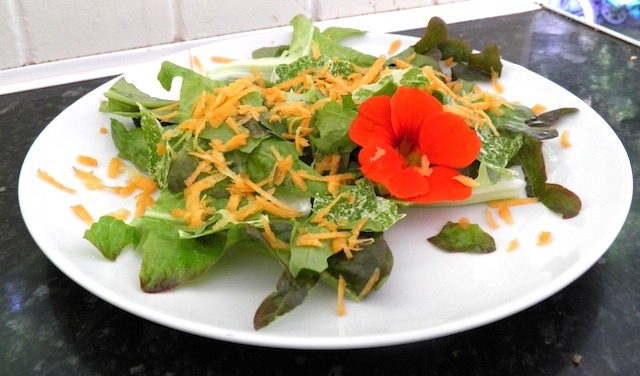 I started with some lettuce – I think it’s a Lollo Rosso type leaf – not too bitter. Then I added a few young lovage leaves, torn into quite small pieces, some nasturtium leaves (the yellow and green splotchy ones) and finally one of the nasturtium flowers – yes, they really are that red. I grated half a carrot over the top, added some olive oil and sunflower seeds (not my grown by me I’m afraid) and it’s ready for your protein of choice to make a complete meal. I had sausage on this day, but you could add bacon, tuna, egg, cheese, prawn……., you get the idea. Lovage (Levisticum officinale) is not a herb that seems to be used very much in recipe books, but I use it a lot. I grew to love it during my three year flirtation with vegetarianism, it has a lovely savoury flavour that really adds depth to stocks, stews and soups. Now that I eat meat I find that it definitely has an affinity to chicken and pork dishes. It says in my herb book that lovage is an untidy, large shrub that should be grown at the back of the border. Well, I didn’t know that when I planted it, so it’s an untidy, large shrub that it’s slap bang in the middle of an island border that makes the whole thing look scruffy! Never mind, it’s been there for a few years now so I’ll dig it up and move it in the Autumn. According to my herb bible: The RHS Encyclopedia of Herbs and their uses by Deni Brown states that the medicinal properties of lovage are: ‘Internally for indigestion, colic, wind, poor appetite, kidney stones, cystitis, painful menstruation and slow labour. Externally for sore throat and aphthous ulcers.’ Wow – in the unlikely event that I ever have a poor appetite I’ll have to make a tisane from it! Although I am curious how you can externally apply this to cure a sore throat. It does seem that I am not making the most of the culinary aspect of this plant though, the young shoots can be blanched an eaten as a vegetable – this is very useful to know as it starts growing very early in the season, well before other vegetables are available. I’m not sure if any new shoots are currently being produced (it’s running to seed at the moment) if so then I’ll definitely try eating them, it’s quite a vigorous plant so there’s plenty to harvest. Nasturtiums (Tropaeolum majus) are great aren’t they – they look fab, really easy to grow, and you can use the flowers, leaves AND seeds for cooking. They taste quite peppery, but I do like that kick in my food! Again, the medicinal aspects of the plants are fascinating (referencing the RHS book again): ‘Internally for genito-urinary and respiratory infections, scurvy and poor skin and hair conditions. Externally for baldness, minor injuries and skin eruptions’. Apparently the plant contains a large amount of sulphur which accounts for it’s anti-balding properties (! ), The seeds are a good substitute for capers, and pickled, have a very similar flavour (due to capric acid). Unfortunately I probably won’t have any seeds as I’m eating the flowers ! Well, it’s good to know that my lunch has so many beneficial properties as well as being very tasty!